Brace yourself; homemade décor, DIY accessories, and even clothing projects are all in store for you when you download your free copy of 9 Insanely Awesome Sewing Ideas: How to Sew a Pillow, DIY Home Decor, and More. This collection is made up of amazing full tutorials from companies you love who have collaborated to create a stunning roundup of projects just for you. 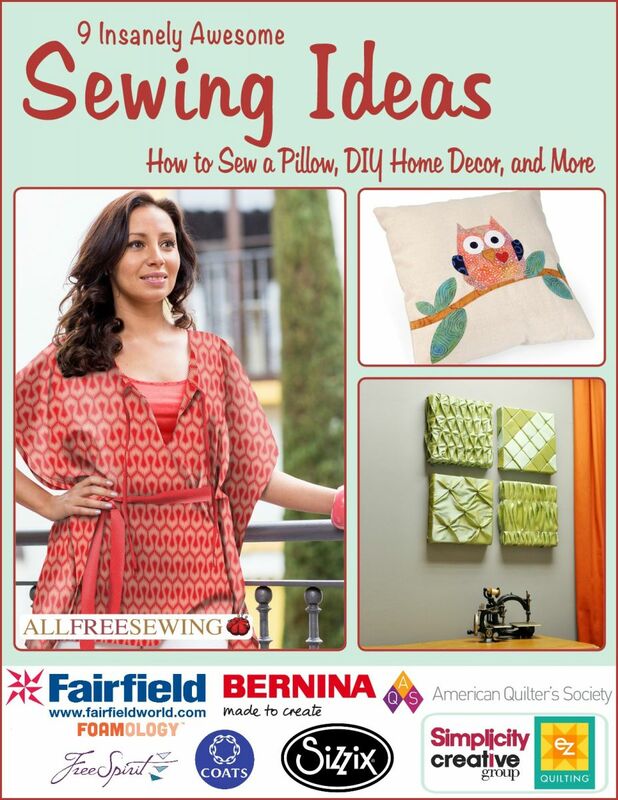 Contributing companies in this eBook include BERNINA, American Quilter's Society, Coats & Clark / FreeSpirit Fabrics, Fairfield / Foamology, Simplicity, and Sizzix. Constructed from professional designers and backed by leading companies in the crafting and sewing community, these projects are fully worth your time in trying. With a variety of project types that include everything from home decor to wearables, this compilation merits your full attention. Download your free copy of the 9 Insanely Awesome Sewing Ideas: How to Sew a Pillow, DIY Home Decor, and More eBook today! This year AllFreeSewing is thrilled to celebrate National Sewing Month by bringing you designs from giants in the crafting industry. Join us in exploring this unexpected, nonetheless beautiful, combination of projects you'll find throughout this piece of sewing literature. Learn how to make wall art, how to sew a pillow, how to sew a shirt, and so much more by simply downloading a copy of this free eBook. 9 Insanely Awesome Sewing Ideas: How to Sew a Pillow, DIY Home Decor, and More is the premier anthology released to mark September's most beloved celebration in the crafting community, National Sewing Month. With its sewing tips and tricks, technical asides, full body instructions, and instructive images you'll undoubtedly ease comfortably into creating something beautiful no matter what page you land on in this eBook. Please enjoy your first glance at 9 Insanely Awesome Sewing Ideas: How to Sew a Pillow, DIY Home Decor, and More and utilize it as a sewing project reference in years to come. Learn how to sew a variety of projects in this free eBook, 9 Insanely Awesome Sewing Ideas: How to Sew a Pillow, DIY Home Decor, and More. Download your copy today! 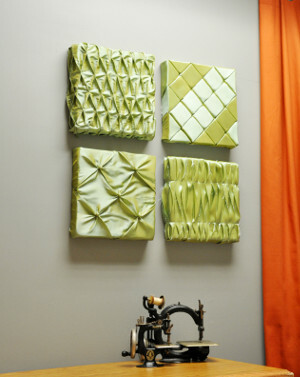 Find out the secrets on how to make wall art and manipulate fabric. Figure out the true technique to sewing pillows. Finally grasp the concept of how to sew a bag to fit your needs, budget, and taste. You can learn all of this and more in 9 Insanely Awesome Sewing Ideas: How to Sew a Pillow, DIY Home Decor, and More. Whether you open this substantial guide to learn how to make pillows or how to make a tablet keepr, you'll undoubtedly feel the benefits of such a pedagogic text. In 9 Insanely Awesome Sewing Ideas: How to Sew a Pillow, DIY Home Decor, and More find ample projects that instruct you on how to create delightful designs for your home decor and general lifestyle. Easy Wall Art (pg. 4) – It’s astounding what you can create given the proper instructions. Spruce up your room’s décor by learning how to make wall art with this fabulous project, compliments of Fairfield. Not only will these instructions result in an unrivaled piece of DIY home décor, you’ll also learn four different ways to manipulate fabric. Enjoy this technical tutorial to expand your sewing skill set. Hexagon Pillow Top (pg. 16) – Learn how to make pillows that will make guests stop and stare. 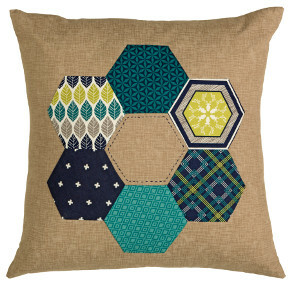 This Hexagon Pillow Top from Simplicity will make the perfect addition to your home. Arranged in a circle, the six hexagons that make up the face of this DIY pillow resemble a crown off flowers. Customize this design to make it year-round appropriate by making a pillow for every season’s colors. You can easily use this project to boost the style of any living space. Voile Tunic (pg. 26) – When you sport this handmade top from Coats & Clark / FreeSpirit Fabrics you’ll inevitably turn heads. You’ll feel and look your best in this loose-fit and flattering piece. Cinched below the bust and flared over your midriff, enjoy complete comfort in a designer pattern. Follow this DIY tunic tutorial to create a look reminiscent of classic Grecian fashion. Learning how to sew a shirt that matches the styles of your favorite department store without matching the price is something you can't afford to miss. Just for You Tablet keeper (pg. 36) – To protect your tablet from unwanted damage, learn how to make a tablet sleeve. This step-by-step DIY tablet sleeve pattern is perfect for those wanting to create something self-indulgent or even as a homemade gift for a loved one. Any level sewist will appreciatethe simplicity of easy sewing projects like this one from BERNINA. Requiring little time and fabric to complete, you can sew a tablet sleeve without a hitch thanks to the project in this eBook. This is a very good book for a beginner sewist and it is free too! The projects are really nice and the instructions are clear and easy to follow so that it is virtually impossible to go wrong. Just alter the fabrics and colors to suit your own home and tastes and you can be assured that you will be very happy with the finished product! Love your site. Whether I am going to sew all patterns or not going through your site is very inspiring and motivating. Thanks. I make dress sketches at home. Mostly lace and net dresses. I want to actually sew these dresses now and sell online. My basic confusion is what size should I cut for the dress. I know that to display my dress for sale I should have the dress ready. Suppose I stitched a Large dress but request to buy comes for a small dress. I know I can alter the dress based on the requester's measurements but then it will waste my fabric. How should I do this? Please advice. Thanks for your help. Who is your target market? First, as a plus size mature woman, I would ask what style is your dress? Would it look good on a large woman or just small, thin, or petite women? That eliminates a great deal of larger sizes if your dress is form fitting and only looks good on a slender, fit body. Next, I would do some research. What sizes sell the most? When you go shopping, do you see dresses similar in style to what you are making? What sizes are those? What sizes are left for clearance? (And don't make those! lol) I don't see any way around having to make extra dresses for displaying that might not get sold. Can you just say "made to order?" If online, people can't see the fabric or size of dress, so can you temporarily finish seams just for a photo? Like make a size 8 or 10, but baste it to show as a 4 o 6? (Unless your target market is 12 and up.) What body will your dresses look best on,and what ages? Start with that! Good luck!